For the first two or three years of Vegetable Growing I tried planning out where I would plant what by design more than anything else. Then I tried the rotation method where you would not sow the same thing in the same place year after year. I have to say that for me, it didn't seem to make the slightest bit of difference. 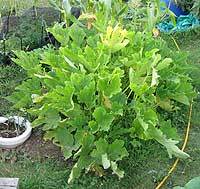 In fact, it seemed that plants such as Squash liked the old Bonfire mound better than anywhere else, I had a fantastic crop! Being a relatively keen Dowser, I decided to try this method. I would first dig the areas, then with a packet of say Carrot seeds in my hand, walk around the patch with my dowsing rods, wait for them to react and mark the spot. I'd then walk a few steps away and do the same thing walking in a circle. As soon as I got the reaction, I put another stick in the ground and that was my guide. For some reason I cannot explain, it was quite rare I would get overlaps or crossroad in the seed line. I sowed all my seeds and waited - hey presto, it worked! It seemed that everything I put in yielded a crop. 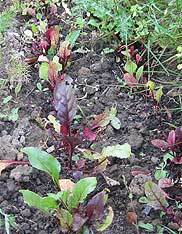 As an example, this year I sowed Beetroot in two places within a few days of each other. The first (which once again told me to sow inside the Runner Bean sticks) flourished with a bountiful juicy crop. The other row which I sowed in 'a gap' (like you do), haven't come to anything. Thousands of years ago, people didn't have Watches or 'dates' as such, they were reliant of various things for their sowing and planting, like the sun and the moon. They could tell exactly from the positioning of the Moon in the Sky when to sow. One of the reasons for this method not being used so much nowadays is simply that it appears to be seen as some kind of witchcraft! We have become a culture of science and look towards 'man made principles' rather than nature made ones! It does tend to make you wonder how anyone survived a few hundred years ago - but they did OK! We also have to remember how much the Moon affects us in other things such as health and temperament, plus of course, our Oceans are set in tune with the cycles of the Moon. Harvest Festival is set to the nearest Sunday before or after the Autumn Equinox on 21st. September and this has been a tradition for many years within and without the Church. It's well worth a try and I'll certainly be up for it in 2011! Astrological Gardening (also referred to as lunar gardening, lunar planting, moon planting, planting by the signs, planetary planting) is a term given to the belief that gardening or farming practices that rely on the timing of different phases of the moon, stars, planets and various astrological signs of the Zodiac can result in the growth of crops of superior quality and quantity. Astrological gardening is thought to have been practiced for centuries, and is still used today by some gardeners and farmers. 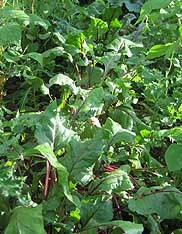 Above - Beetroot sown 'as told to' by dowsing and below, Beetroot sown where there was a bit of space left over. Both taken on 6th. August 2010. If starting vegetable gardening for the first time, loads of people have old pots etc. to give away and you'll often find loads in Skips !